This is a beautiful analysis! Thanks for pointing out the fact that in his farewell tour, everything he did was giving. 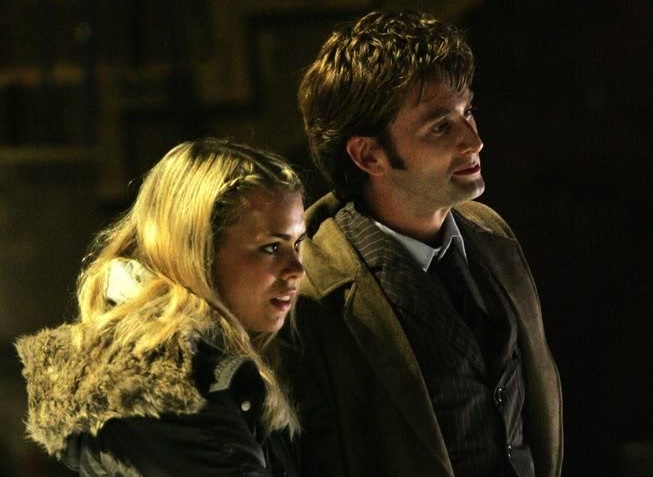 Most comments I’ve seen on that set of scenes ridicule it because they felt the Doctor was being selfish, going back to “get his reward” by going to see his old companions one more time, but as you point out, he could have chosen any points in those people’s lives and all the points he chose were ones in which he could help them. Gosh that’s awful of people. What he did in his farewell tour was a beautiful thing, and he so much deserved it, after everything he’d done. Ah well, people. Thanks for liking this analysis! I agree – beautiful analysis, and pointed out somethings that I had forgotten, or had only begun to realize myself, particularly the transition from the Ninth to the Tenth. Hey thanks! Always happy to enlighten. I love Ten a lot, and his journey is really interesting to trace. I love Ten, too, but I’m not so able to explain the reasons why, And this become frustrating when I meet people who dislike him. So thanks a lot for your beautiful analisys! I think the Day of the Doctor didn’t show us who Ten really is, and this made me be disappointed. I have the sensation that, even though in good faith, tDotD makes only a parody of this character as if there is no interest in the dept of the character (in spite of this dept is the reason why we love him). 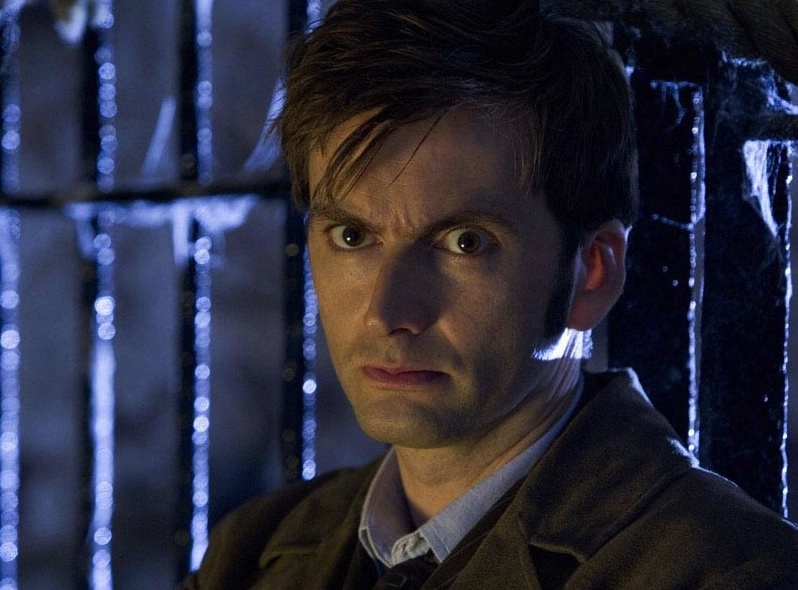 As you said very well, he is a complex character, all his responsability, humility, the way he sees life as incredible, his solitude for being the last of the time lords, that is something he can blame himself for, the awareness of he can be dangerous, the awareness of the time of his death is near…I know the episode wasn’t about Ten but Ten was in the episode and I would have liked to see a more complex character. I wish I could know your opinion about this. Thanks for your thoughts Chiara. Pardon the late reply here! I was hoping to make a big response to this, but looking back on DotD has been really hard for me, because I don’t like what was done to both Ten and the Who franchise in it. But you’re right. Ten’s heart and core is really lost in that episode. It felt more like Ten fanfiction than anything else, with all the gimmicks and catchphrases that come out of Ten (awkward romance, running about, a bit of dumbness and the lofty language about himself that some can see as vanity – ugh). Moffat imported a lot of Eleven’s dialogue into Ten (that line on “so grown up” was not Ten at all), because Moffat precisely said before the 50th that the Doctors really sound alike (no, Moffat, they do not) and that on paper there’s hardly any difference. That’s just not true, because the core of each of these guys (Ten, Eleven) is different, and if the heart is different then the dialogue, mannerisms, fears, style of speaking, etc will all differ as well. There is not really any depth of character to Ten in DotD. Yes, it wasn’t his show, but that’s no excuse for not giving one character what’s due for his arc and place in the show. There’s a whole crop of things that can be said about how Ten’s personality in DotD doesn’t fit at all in the arc of his timeline, being just post-Waters of Mars. Ten is a mature person, and there could have been so much dramatic importance to the events that were taking place with regards to his own shifting view of himself and what he has done and lost. Ten in DotD was just a flat icon of Ten, not the real man. Not to mention the complete 180 degrees of moral viewpoint on what should be done at the end of the Time War. Yeah, maybe Eleven thinks saving Gallifrey is worth bringing back all the bad things that happened at the end of the war, but not Ten, who *just after* DotD went and confirmed his decision to end the war via the Moment (by sending the Time Lords back into the war in End of Time). There’s a huge moral contradiction between DotD and EoT, and THAT is the primary reason why I have to reject DotD’s veracity, not to mention all the practical reasons that DotD couldn’t have happened. 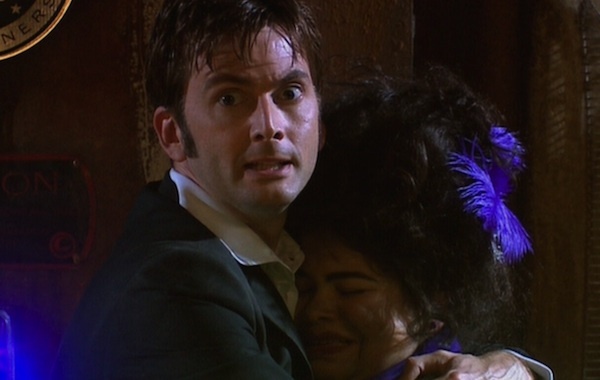 Anyway, this whole problem with Ten’s characterization in DotD can’t be blamed on Tennant. He did the best he could with his material, and that material was unfortunately tainted by Moffat’s digression in the understanding of Ten’s character. I was very interested in the argument because when I watched DotD in november and I said that the Tenth Doctor of the DotD wasn’t the Ten we had known in the Tenth seasons, people (pretended that they) didn’t understand, and this thing highly riled me. 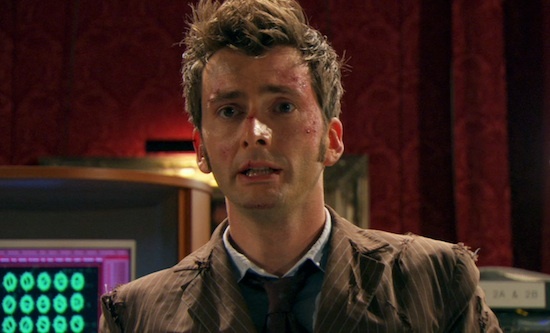 I do not blame Tennant, I think he fairly just did his work end left Moffat’s work to Moffat. The companion Mel, travelled for some episodes with the Sixth Doctor and after the Doctor regeneration she travelled with the Seventh for only four episodes. When she left the Seventh Doctor, he was sad because after every regeneration the Doctor starts to watch the world from a new point of view .The Seventh Doctor complained about he had just begun to know Mel from his own point of view. Same Moffat writes “the man who regrets” and “the man who forget” this means he admitted they are different, or are these ephithets completely stereotypical and meaningless ?? The Day of the Doctor, revealed that Moffat didn’t care and didn’t understand and didn’t like Ten’s character, so I defenitively realized Moffat style can never fit my taste. You know, the first time I read this post, I didn’t watch the video because I was at work, and then I forgot to come back to it. I just watched it, and it was absolutely fanastic! You captured the Tenth Doctor so well! I was crying at the end (the four knocks scene always does it for me). You and your sister are so talented! I really want to thank you for this accurate and wonderful analysis. I just finished to watch Ten era and it made me think so deeply about the sense of being human. At last, I find this is the most Humanistic show of our times. So good your sinthesis of The Doctor’s feelings: “transparent and intense.” That is why he is as wonderful as dangerous. I will keep this article for my Carl Jung analysis docs. Thanks.